A delicious sauce that starts out with brown butter and a quick sauté of garlic and shallots then the addition of three kinds of mushrooms. It is finished with the addition of sour cream adding to a rich finish. 12 cooked warm meatballs -- or as many as you want. Fettuccini made according to package directions. Melt the butter over medium heat in a pan with a light-colored bottom so you can keep an eye on the color of the butter. When the color of the butter turns from lemon yellow to a golden tan add the garlic and shallots. Sauté for about a minute. Add the mushrooms and continue to sauté until the mushrooms release their liquid and you can see them taking on a golden color about 10 minutes. Sprinkle the flour over the mushrooms and mix well. Sprinkle in the thyme and continue to sauté for about another few minutes cooking the flour with the butter and mushrooms. Stir in the beef broth and wine. Season with salt and pepper. Cook for another 10 minutes. The sauce should be thickening. Stir in the sour cream, mixing well. Add the meatballs to the creamy mushroom sauce and cook for another 2 to 3 minutes bathing the meatballs with the rich sauce. 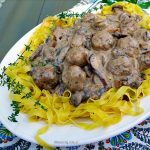 Serve the meatballs and creamy mushroom sauce over the prepared fettuccine. ** We like to use Wondra flour when making sauces -- it is easy to use and doesn't clump.